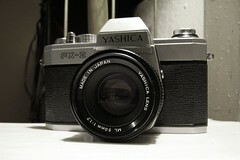 The Yashica FX-2 is a 35mm SLR camera manufactured by Yashica in 1976. 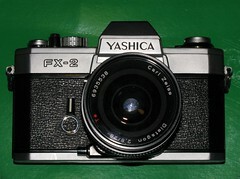 The FX-2 was the second camera to use the new bayonet lens mount known alternately as the Contax/Yashica mount or C/Y mount. 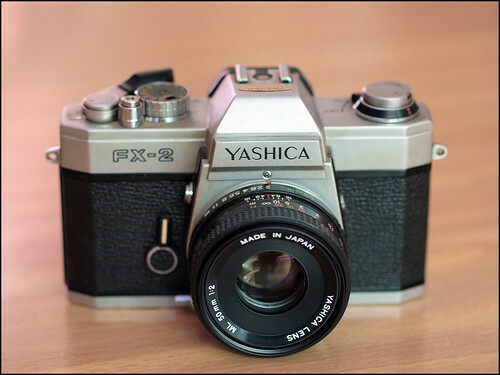 The FX-2 viewfinder provide 0.89x magnification, providing a nearly 90% field of view. The metering is done via a needle on the right side of the viewfinder display. Choosing the proper shutter and aperture combinations will result in proper exposure with the needle aligned between the + and −. 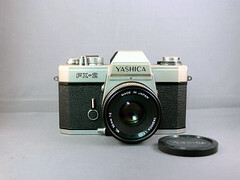 The focus is done manually on the lens, to make it easier the view finder screen features a central spot with a micro-prism screen. This page was last edited on 26 August 2017, at 04:33.